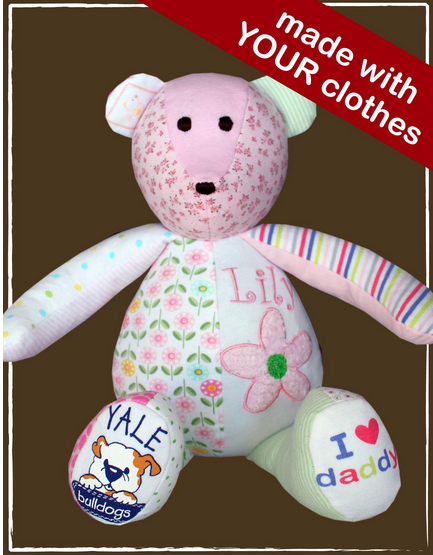 Rose and Her Lily: The Patchwork Bear Discount! I first heard about The Patchwork Bear when Still Standing Magazine gave away one of their bears recently. Immediately, I was so touched by how sweet their bears are, especially the baby clothes bear. It is a great memorial item, made with your baby's actual clothes! After losing a baby, it's hard to know what to do with those clothes bought just for them that they'll never get to wear. This is a great idea for what to do, to always treasure those clothes. And it's a great way to display them! Today, in honor of National Teddy Bear Day, The Patchwork Bear is having a deal for 40% off all their teddy bears! So, if you're interested, purchase your bear quickly. Check out their website at www.thepatchworkbear.com for more information. At checkout, use the code BEARDAY.